At first sight it's really great news. 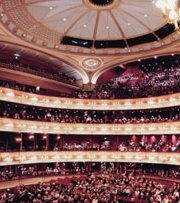 The Royal Opera House, Covent Garden has announced the launch of their own Heritage Series label with plans to build a catalogue of 20 operas over a four year period. The first two releases are even better, the Otello which was Rafael Kubelik's first production at Covent Garden (left) as Music Director in 1955, and a 1959 Lucia from Joan Sutherland's first run of performances in the role with which she is most associated. But it is worth looking behind the scenes of the Royal Opera's Heritage Series label. It is billed as ' an important collaboration between The Royal Opera House Covent Garden, IMG Artists Audio Visual Division and BBC Radio 3'. But IMG Artists are very much in the driving seat of the project, and they describe themselves as 'the global leader in the arts management business'. They represent a raft of performers from John Adams and Thomas Adès to Jiri Belohlavek - who is Chief Conductor of the BBC Symphony Orchestra which is also represented by IMG and licenses its recordings to IMG Artists' BBC Legends label. Another IMG managed conductor is Antonio Pappano - who is Music Director of the Royal Opera House whose Royal Opera Orchestra is also represented by IMG, and when Papanno (below) is not busy at Covent Garden he is either recording for EMI Classics who license their recordings to IMG Artists' Great Conductors of the 20th Century label, or is writing glowing testimonials over on the IMG Artists website for the Covent Garden Heritage Series label, which is run by John Pattrick who is director of IMG Artist's Audio Visual Division and before that ran EMI Classic's UK operation ...... do you start to get the story? On An Overgrown Path has written in the past about the hidden power of agents such as Askonas Holt and IMG Artists. The endgame for them is complete control of the music distribution chain, and they already have a stranglehold on conductors, soloists, orchestras, and TV documentaries. For a long time they have had their eye on the the delivery end of the chain, and IMG Artists already controls venues, DVD and CD labels, and 2004 saw the start of a joint collaboration between Naïve (France) and IMG to 'produce, market and develop the Andante label'. Classical music is certainly sharing deskspace with big business here - IMG Artists' corporate clients include Audi, American Express, BMW, Petronas, Ford, MasterCard, Esteé Lauder, and Singapore and Malaysian Airlines, while Askonas Holt add Daimler Benz, BP Amoco, NEC and Reuters, and others, to the super agent's client list. Until 2003 IMG Artists was part of the massive IMG World sports and media management company whose clients include Tiger Woods, Kate Moss and Michael Schumacher, but the majority owner of the company is now the impressario and entrepreneur Barrett Wissman. The market economy is a wonderful thing. But the next time you go to a concert, or buy a CD, do ask yourself whether the performers are there through merit, or because of who their agent is? While it was never completely meritocratic, the global cultural world (marketplace) certainly is being partially undermined today by widespread nepotism -- both real and as a figure of speech. Thanks for continuing to highlight these profit-seeking corporate and insider connections. Merit? I think we all know the answer to that. Absolutely not! It's become corporate and we're all the poorer for it. We've all seen too many executants whose demonstrative powers underwhelmed. They may take a great picture, however. I appreciate this is going off on something of a tangent, but I was reading the latest issue of Gramophone in my library this week and couldn't help but notice that very bland film soundtrack reviews are being shoehorned into the orchestral reviews section. Is this the ultimate fate for the classical recording industry monopolised by these agents "complete control of music distribution"? Dwindling new releases of the same old core repetoire performed by their latest minions and padded out by weak cinematic soundtracks. Is this what the future holds for the classical industry? Matthew Westphal of Playbill Arts gives an advance peek at the release next week of the American magazine "Opera New's" compilation of the "25 Most Powerful Names in U.S. Opera".